This chapter presents a case study of the smart city initiatives in New Taipei City (NTPC) in Taiwan. Using the integrative framework proposed by Chourabi et al. (Understanding smart cities: An integrative framework. In 2012 45th Hawaii International Conference (HICSS) on System Science (pp. 2289–2297). IEEE. 2012) as an analytical lens, the authors discuss the characteristics and scope of NTPC’s innovations in delivering services and managing resources using ICTs, as well as the policies, human, social, and cultural contexts that shape the adoption and development of these smart technologies. A SWOT (strengths, weaknesses, opportunities, and threats) analysis was conducted in response to the research question, contributing to the identification of lessons learned, from this particular case, which may have broader relevance for other smart city initiatives. The authors would like to thank Ms. Hsin-Yu Huang of the RDEC in NTPC for her assistance in collecting and compiling information. Chen, Y. (2011, July). Family friendliness among five special municipalities. Parenting Magazine (in Mandarin Chinese). http://www.parenting.com.tw/article/article.action?id=5020933.Accessed 11 March 2014. Chung Hua Institution for Economic Research. (2013). Taiwan economic forecasts 2014 (in Mandarin Chinese). http://www.cier.edu.tw/ct.asp?xItem=12375&CtNode=105&mp=1.Accessed 11 March 2014. Committee of Digital and Knowledge-based Cities of UCLG. (2012). Smart city study: International study on the situation of ICT, innovation and knowledge in citiesAccessed 11 March 2014. http://www.cities-localgovernments.org/committees/cdc/. IBM. (2013, April). New Taipei City and IBM joins force to build a smart city. IBM Blue View (in Mandarin Chinese). http://www-07.ibm.com/tw/blueview/2013apr/8.html Accessed 11 March 2014. Liao, Y. (2013, March 27). New Taipei City and IBM initiates smart city challenge. DigiTimes (in Mandarin Chinese). http://www.digitimes.com.tw/tw/things/shwnws.asp?cnlid=15&cat=10&cat1=20&id=0000327323_RZS4W7U01CYLWB49FMR9K. Lin, C., & Lin, P. (2011, January). Interview with New Taipei City Mayor. Global Views Monthly (in Mandarin Chinese). http://www.gvm.com.tw/Boardcontent_17225_1.html. Mortensen, J., Rohde, F., Kristiansen, K., Kanstrup-Clusen, M., & Lubanski, M. (2012). Danish smart cities: Sustainable living in an urban world. Copenhagen Cleantech Cluster. 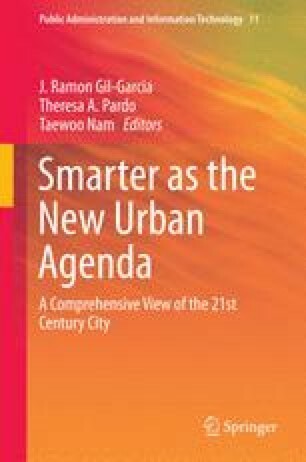 http://www.cphcleantech.com/home/publications/reports/smart-city-report-2012.Accessed 11 March 2014. National Statistics of R.O.C. (2013). New Taipei City tourism statistics 2012 (in Mandarin Chinese). http://www.stat.gov.tw.Accessed 11 March 2014. NTPC. (2014). About New Taipei City. http://foreigner.ntpc.gov.tw/_file/2968/SG/44813/D.html Accessed 11 March 2014. Profile: Appointment as vice premier will put Taoyuan County’s Eric Chu to the test. (2009, September 9). Taipei Times. http://www.taipeitimes.com/News/taiwan/archives/2009/09/09/2003453131/1. Rios, P. (2008). Creating “the smart city.” http://archive.udmercy.edu:8080/handle/10429/393. Accessed 11 March 2014. West, D. (2007). Global e-government, 2007. Brown University. http://www.brown.edu/academics/taubman-center/research-and-initiatives/e-government.Accessed 11 March 2014. Yu, C., & Hwang, A. (2014, February 17). Taiwan market: Chunghwa Telecom aims to kick off 4G operation in July. DigiTimes. http://www.digitimes.com/news/a20140217PD212.html.Accessed 11 March 2014.